Relatively new brands Parmigiani Fleurier (est 1976) and Richard Mille (1999) may consider Mount Street more relevant for their younger client audience and unique pieces but manufacture d’horlogerie still wish to secure the globally recognised ‘Bond Street’ address. In September Allegra Arier watches will be available alongside black diamonds in the new deGRISOGONO boutique at 15 New Bond Street, adjacent the affectionately known “chocolate box” which sadly will be demolished as part of the Pollen Estate development plans. Jaeger LeCoultre (1833) and Chopard (1860) have already secured much larger boutiques, CHANEL watches & jewellery are completely rebuilding No 173 behind the facade, to follow the openings of Patek Philippe (1852) IWC (1868) and heritage brand Vocheron Constantin (1755). Mono-branded boutiques definitely seem to be the way of the future as Kering, LVHM, Richemont and Swatch groups all seek to completely control their representation in Mayfair. Many fashion brands are successful vertical retailers and it appears that watchmakers of distinction now seek to execute distribution and sales through direct communication with their clients. With the rental of a modest boutique starting at £500,000pax and key money of over £2M the improved margins, removing the “retailer” from the equation and securing house boutiques must be high on the boardroom agenda’s in Paris, Milan and Geneva. More competition exists within the refurbished Watches at Selfridges and The Fine Watch Room in Harrods arriving within the Shopping Guide to London and specialist vintage pieces are also available at Watch Club (Royal Arcade), WatchFinder (Royal Exchange) and Somlo (Burlington Arcade). 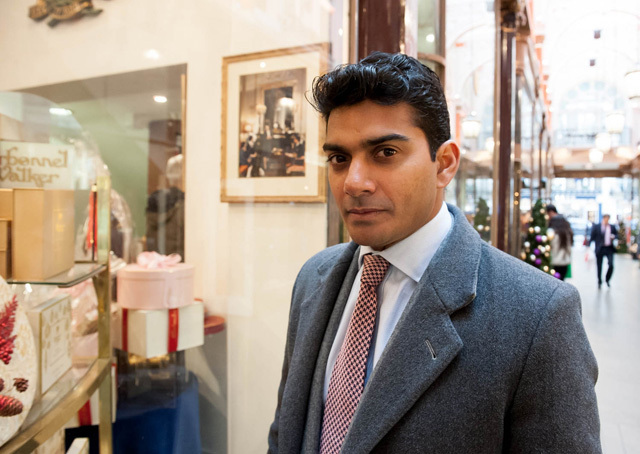 There are still at least half a dozen watch makers seeking that elusive boutique on ‘Bond Street and no doubt 2015 will see similar key money premiums paid to vendors as Longines did to acquire No11 (£8M) and Patek Philippe to secure No14 (£10M); if not more! On a cold winter’s night at the end of 2014, a gaggle of ‘arty’ types gathered at the top-end of New Bond Street. In contrast to the Christmas gift-seekers who are buzzing past with large bags, this little group were not here to late night shop. Instead they had come to toast the launch of something a little more creative – the Bond Street Windows project; a series of contemporary artworks running on the façades of no’s 67-71. And to make things feel more like a private view (albeit outdoors on a busy shopping street), homemade whisky macs cunningly disguised in paper coffee cups were handed out amongst the small crowd – or perhaps I shouldn’t be telling? 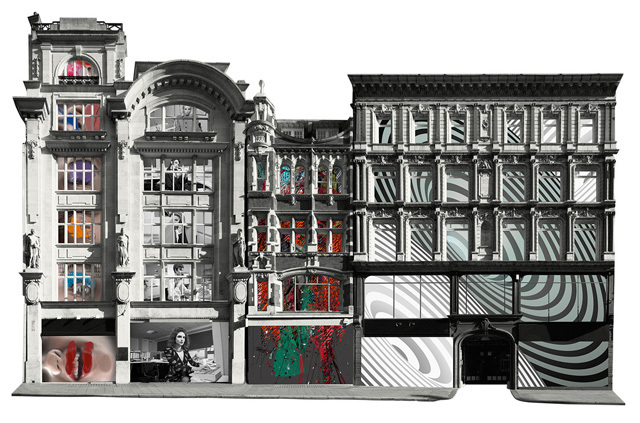 Bond Street Windows is a site specific work organised by London-based Foxall Studio, best known for producing work for leading fashion and art brands. The window installations, which features work from four UK-based artists appears on a row of juxtaposing façades and will run until the end of this year. The buildings, four in total and measuring 50 metres across, are currently vacant as work to construct the subterranean Crossrail construction continues deep beneath the Bond Street pavements. “We wanted to make a set of artwork that would generate enough intrigue throughout the year or so of it being installed,” says Andrew Foxall who curated the project with his brother Iain. “It was an important benchmark for all the work and the result is hopefully artwork of enough integrity and novelty that succeeds that aim,” he explains before topping up my paper cup with more of the potent toddy. The works run from left to right – in the direction of Oxford Street to Piccadilly. On the first building, a tall skinny edifice, the Foxall team spent a day in the studio with make-up artist Isamaya Ffrench to create her vibrant façade images. Using her installation as a window on the future of beauty trends, Isamaya pressed her face on the glass of a flatbed scanner to create images intended to provoke thoughts on the future of decorating the face and body. As a result, her misshapen lips are smudged with red lipstick and eyebrows are smeared with aqua blue eye shadow. It’s Warhol-esque and I like it. The next façade is by Robi Rodriguez, a fashion photographer who studied film in LA and now shoots for some of the best fashion magazines around. The stills in his windows piece are taken from a recent film he shot for London-based fashion magazine Dazed and Confused. They depict prim-looking models perched at their desks in an outdated office environment. Back at the gorilla-style private view, Greek-born textile designer Teresa Georgallis is craning her neck to look up at her work (produced as a collaboration with Universal Assembly Unit), which is bouncing around on the brick façade before us. Her digital fabric pattern, which looks as if it has been woven on a jacquard loom, responds to sound input and is encoded with inaudible sound frequencies outside the human spectrum. The sounds are derived from noises recorded on Bond Street. She tells me her next project will be designing a collection of one-off handbags and talk quickly switches to the bags we are both carrying – hers is vintage Chloe and looks cool and well-worn. Finally, on the last and the largest of the empty storefronts, ceramicist Jin Eui Kim, projection features huge swirling patterns with monochrome stripes, reminiscent of the British artist Bridget Riley’s early work. By now it’s getting even colder and the group begins to peel off in different directions. But I know I’ll be back. I’ve already decided to return tomorrow and see the work in sobering daylight. And when I do, my hunch is right. Thanks to the stunning imagery, these beautiful old storefronts really do spring to life. Ah… January. A sobering month in which to purge the cupboards of remaining festive fare and wax lyrical on the cleansing powers of kale and anything else boasting the word ‘super’ in front of it. Then of course there are the New Year’s resolutions for which a new notebook in which to log them in is essential. 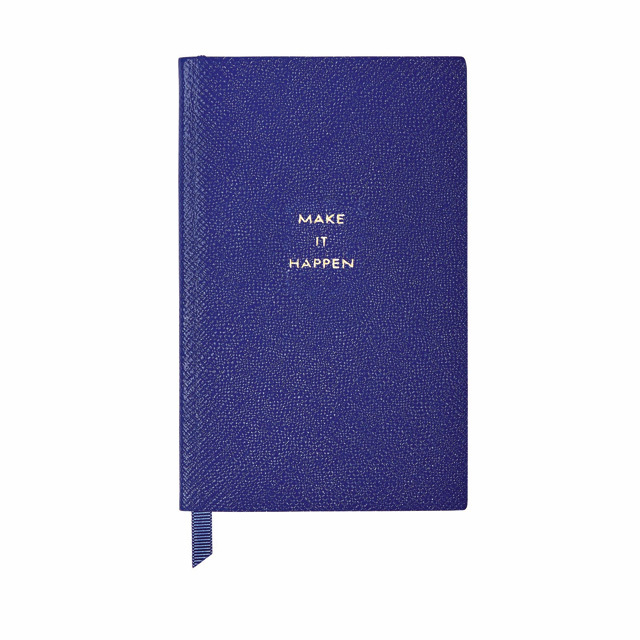 Cue Smythson’s pocket sized version in lambskin (£45). With affirmations appearing on everything from bags (see Anya Hindmarch’s ‘Believe & You Will Receive’ clutch) to bathroom mirrors, Smythson’s motivational slogan says it all. Make it Happen! Well go on then. As co-founder of equine membership club – The Riding Club London – Ashley Parasram first took to the reigns while studying in Eastern Finland. He later became an amateur show jumper whilst working for the World Bank in Indonesia. Today, the club provides access to fine horses, venues and instruction in the heart of the capital as well as beyond. So where does this stylish globetrotter like to dismount when he is back home in London? The cocktail bar in Claridge’s provides a wonderful pre-dinner drink venue and is only a stone’s throw from the Savile Club where we often host Riding Club Dinners. It’s a very stylish and cosy room to sip a drink in and enjoy the atmosphere before dining. The staff are very attentive. I’ve never had to wait longer than 20 seconds before the cocktail order was taken and 1 minute 30 seconds before holding it in my hand. Very impressive! Although I don’t spend as much time here as I would like, it has a wonderful selection of ties and is the ancestral home of my favourite tie. The store is lovely to wonder around in and see the classic British designs. On occasion, I dream of walking in and finding an 18th century riding coat. These are making a comeback and are just waiting to be taken out for a spin in Hyde Park. This is such a wonderful store with a fine selection of clothing and accessories. I always gravitate towards the latter with the hope that I will find the same style of key ring I once had. It featured a lovely woven leather strap, which was attached to your belt and had a brass fitting on the end for keys. The idea was that you would never leave your keys behind. Almost fool proof but sill I managed to leave the keys and the key ring somewhere. I’m hoping the design will make a return to the Mulberry collection one day. The best drinking chocolate in the world! In the winter mornings when I go riding in Hyde Park, I make my own version of a mocha using Charbonnel et Walker’s drinking chocolate and coffee. This is a perfect start to my day. If however it’s a bitter cold morning then a shot of whiskey is added! You can’t beat a Smythson’s diary. Spending half the year overseas, it feels like I’m carrying a piece of London with me wherever I go. I don’t know where I would be without a note pad. Even my ‘to-do’ lists have sub-sections of to-do lists! Amanda Wakeley launched her eponymous womenswear label twenty-five years ago. Today, the former model-turned-designer has a brand new flagship at No.18 Albemarle Street. As for her Spring/Summer 2015 collection, think white – as in crisp white shirts, kimono jackets and plenty of soft tailoring. This is the woman who coined the phrase ‘clean glam’ after all. I had a very glamorous mother and I remember being fascinated by her wardrobe. At first I started to intuitively create clothes. My first piece was my costume for our school play when I was about nine-years old. I was barely tall enough to use the sewing machine and made my costume out of my mother’s cast off fabrics. Are you self-taught or did you take the fashion school route? I started to create my own clothes when I returned from the US because I couldn’t find the chic pieces I had fallen in love with in New York here in London. I started designing for myself but gradually my friends kept asking me to create one-off pieces for them and so it all started there. I have been self-taught right from the beginning and I have learnt many lessons along the way! What makes you tick creatively? I always love to read inspiring coffee table books on design, interiors, architecture, travel and nature as well as fashion. How has London shaped and inspired your work? I love the diversity of London’s design scene but I think my inspiration comes more from nature than from the city. London, Paris, Milan or New York? Whether you’re looking for a vintage piece from a stall in Portobello market, or you want to experience the luxury of shopping in a designer store – you can find pretty much anything in London. That’s what makes it so unique. I take a ‘London/cosmopolitan’ attitude towards my designs so even though London is the home of the brand I think the Wakeley woman definitely has an air of European glamour about her. Describe your new flagship on Albemarle Street. My store is an absolute labour of love! I have always wanted to design the interior of my own store and create a homely, warm and inviting environment and have been lucky enough to do that here. I also wanted to fuse some of the inherent architectural features of this beautiful two-storey townhouse with a modern touch to create a mood that is both timeless and current. I love so many parts of the store from the bespoke draped chain chandelier to the petrified wooden sink – it’s hard to pick just one. Where are your favourite hangouts? I often hold meetings at Brown’s Hotel, opposite my store. You always receive the most amazing, impeccable and charming service there. I love people watching at Scotts, or for an intimate cocktail I’ll head to The Fumoir at Claridges. How essential is a basic white shirt in a woman’s wardrobe? I always have white shirts that feature in each of my collections. There is nothing better than a perfectly crisp white shirt and every woman should own at least one.